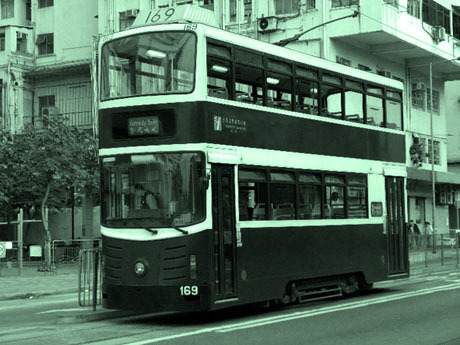 Hong Kong’s trams, the so-called Ding Dings, are both eccentric cultural assets and daily used means of transport. A loud jingling guideline for all visitors like me. Following the main roads along the coast you can just jump in and out to explore on your own. Slower than the metro of course but much more on the pulse of the city. But the tram advertised by Art Basel was the opposite: a tram as a calming influence in the fast and crowded streets of Hong Kong during the days of the art fair. The tickets for this satellite that encompassed the city had to be reserved days in advance, so expectations were high. When the black painted tram arrived, visitors were already waiting at the station. Gently guided by two young women, instructions were given on the first floor. The windows were covered with a dark brown film, only allowing light to shine in through clear sections of text. What we had boarded, was the mobile artwork: Twenty-Five Minutes Older by Kingsley Ng. And, in truth, time seemed to run a mite slower in it. Texts on the windows explain the stories behind different elements of this multimedia work. The first text describes the work’s first layer: a sound installation encountered later is based on selections from Lau Yee Cheung’s locally well-known novel Tête-bêche (). This story said to have inspired „In the Mood for Love“ () by Wong Kar Wai, one of the most influential Hong Kong movies. The second layer was the title itself, a reference to Herz Frank’s 1978 Latvian black-and-white documentary Ten Minutes Older, which observed a group of children watching a 10-minute film. Althought the dramaturgy of Frank’s film lies only on the facial expressions and an old-fashioned film score takes me under its spell, when I watch it at home. Even if the composition of the whole tram seems with its sightseeing character easily accessible, it needs some research to explore all the hidden side blows. To explore to the third element of the work we climbed the stairs to the second floor. Not as easy as it seems in these old rocking vehicles. Windows were sealed on the upper floor, only two benches on either side of the tram were illuminated. Split into two groups, we decided which of the two audio lines to listen to before taking a seat. The mood became dreamlike; as soon as the headphones had been put on, the lights dimmed and the journey began. Music took us by the hand into the darkness and projections slowly appeared. The entire upper level of the tram was made into two camera obscura, and so and turned the interior into a moving viewing room. Turned upside down through the lens, the outside street scenes flickered on the inside walls. Using a simple visual setup, light entered the enclosed environment through an aperture and was cast, inverted, onto the inner surface. Lights appeared in the viewer’s mind like vague, forgotten memories coming through the shadows. Together with the soft rocking of the tram and the quietly spoken story fragments we were lulled. Surprised when the lights suddenly came on again, as quickly as a dream disappeared, the immersive experience was over. The next group was waiting so there was no time to lose. A bit overstrained our group flushed out of the doors on the other side of the city. Blinking in the sun and trying to regain one’s orientation, the shuttlebus back to the exhibition centre was already honking. It’s an exemplary episode for these art fair days where one life changing experience follows the next. It’s just a pity the soft-spoken tones are forgotten too often in the racket. Der Text entstand im Rahmen Tracks „Schreiben über Kunst“ des Master Kulturpublizistik und des Cultural Journalism Campus, der im März 2017 zum ersten Mal mit der Beteiligung von zwei ZHdK-Studierenden stattfand.